We get a ridiculous amount of Spam at the Internet Storm Center. Most of it is mundane and is promptly ignored, but every once in a while one comes in that gets your attention for being different. 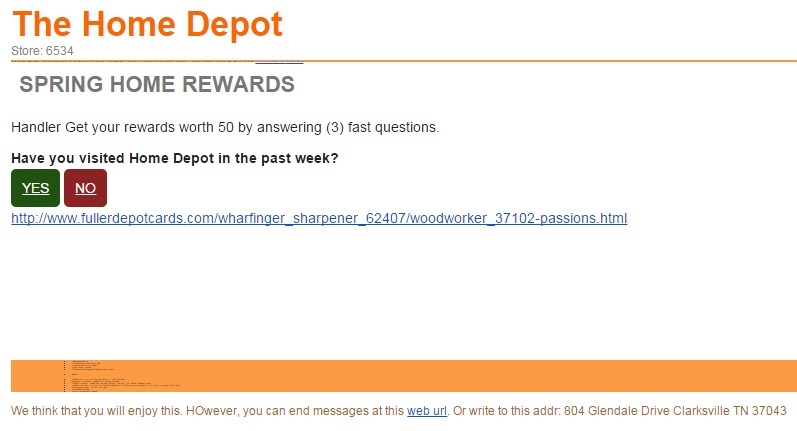 At first glance it looks like yet another run of Home Depot Spam. It isn't very sophisticated and isn't likely to fool many. The usual spelling mistakes and broken English. They didn't even bother to link in Home Depot's logo. By the time I received it both of the URLs in the message were dead, so I wasn't able to measure what its intent was. We think that you will enjoy this. 1. Seed the bell peppers and cut them into 1-inch chunks. Stem the cherry tomatoes and halve one-half of them, leaving the others whole. 2. Peel and thickly slice the cucumbers, and thinly slice the red onions. Cut the feta cheese into 1-inch cubes. Crush and mince the garlic clove. 3. In a large bowl, combine the bell peppers, tomatoes, cucumbers, onions, feta cheese, olives, anchovies and capers and toss together. 4. In a small bowl, whisk together the vinegar, garlic, dill, oregano, salt and pepper. While whisking, slowly drizzle in the olive oil to make a thick dressing. 5. Pour the dressing over the salad, toss and serve now. This is the most delicious salad - fresh and wonderful-tasting. FYI, lettuce can very much be a part of any greek salad - if you want it to. We like lettuce in my family and I often add it. It would not be 'authentic' in a Horiatiki (village) salad, but who cares? With the OpenSSL updates this week I am sure you are all diligently testing and deploying to all your vulnerable servers. Something you may not have though of is that most SOHO routers run some kind of *nix variant and will most likely make use of OpenSSL. Be sure to watch for new firmware for those devices as well. On Friday I live chatted with two of the larger manufacturers and neither had any timeline for deploying new firmware containing the OpenSSL patches and both said to watch for new releases of firmware.